Once upon a time everything was recorded in mono. With one mic. How simple was that? A mic, a mic amp, a recorder. Then someone in the 30’s decided that it sounded better if he also laid some close mics on the soloists to bring the solos up in the recording. That meant some signals had to be mixed together, and the mixer as we know it was born. The earliest mixers had just two purposes; 1) They allowed you to introduce more than one input, and send them out to more than one destination. So they had to ‘route’ signals. 2) They also allowed the relative levels of these multiple signals to be adjusted with ‘faders’ so that the output wasn’t too loud or quiet. So there are two sound sources in a studio: the current live performance, and the stuff playing back from the recorder that has already been done. There are also two destinations: the recorder to record the current performance as a ‘overdub’ on another track, and the main mix output, where engineer and performer get to listen to a rough approximation of the final result (the ‘monitor’ mix). The Input Section, where the inputs come in. The Monitor section, where the pre-recorded parts are listened to. The (sub)Group section, where signals are adjusted for level before they go off to the recorder. Lets look at a simple desk layout –this desk has 3 inputs, 2 sends to tape, 2 tape monitors and a single mono output. Diag 1. A basic mixer. A format that carries on to this day and is still extensively modelled in software and digital products. The long wires that the inputs and outputs feed their signal onto, or take their signal off of, are the ‘Busses’. A name whose origins date back to the heavy metal ‘buss bars’ that went up and down the length of old industrial revolution factories. Diag 2. The ‘Split’ format mixer. Easy to understand, but quite wasteful of space. We admitted earlier that performers may need to listen to a mix so different from that which the engineer has that a separate set of mix faders needs to be provided. These produce a mix totally separate from that made by the engineer, the source of these signals is before the engineers’ faders and unaffected by their movement – this ‘Auxilliary’ mix is therefore before or ‘Pre’ Fader. Diag 3. Pre-Fade. The same mixer input channel with a pre-fader Auxiliary (usually on a knob, not a fader) for creating headphone monitor mixes. Another use for an auxiliary send would be to feed signals to a reverb or other time delay effect. Now when we vary the level of the unaffected ‘dry’ signal with a fader, we expect the reverb for that signal to vary in proportion, so we need to pick up a feed for this sort of auxiliary send after (‘post’) the fader. Now auxiliaries are fine for ‘effects’ (i.e. things that take the original signal, mess with it and then are added to the mix via another mixer channel). But what about signal processing that affects the whole signal? Like a gate, or a compressor, or an external EQ? Now here we need a mechanism by which we can effectively ‘insert’ an external processing box into the signal chain, by way of, unsurprisingly, an ‘insert point’. Diag 5. Insert point. Now we have a way to drop an external processor into the signal path, replacing the original signal with the processed version. The insert is provided by either a pair of, or single, stereo, jack – specially wired to break the path when something is plugged in. With nothing plugged, the signal passes uninterrupted. Some big mixers offer insert points both pre and post EQ. We have shown the most common position in an analogue desk – post. It must be noted that in all digital desks, the analogue insert is before the A-D converters, and thus is pre-EQ. Lets pay a bit more attention to the input stage now. As most of you probably know, the first choice facing you when plugging a signal into a mixer is: ‘mic’ or ‘line’? The mixer will only work it’s best with a signal lying between quite distinct level (voltage) limits (see ‘Tech Terms’), so it’s the job of the input stage to boost or cut the input signal to match what the desk likes. Most ‘line’ level signals (synths, outboard, recorders etc) have outputs pretty close to line, and only need a modicum of adjustment to meet with the mixers approval – these use the ‘line’ input setting to provide a small amount of trim. Microphones on the other hand, have signal outputs a couple of powers of ten below line, and so need these tiny signals boosting heavily, and a separate specialist amp section is employed to achieve this high gain result. At this stage you will probably also encounter a ‘Pad’ which will shift the gain window of either of these two input stages down by 20 dB (to avoid distortion with louder signals), and a phase reverse switch (more of which another time I’m sure!) which (briefly) makes sure that in multi-mic set-ups the mic signal waveforms are rising and falling in unison and not cancelling each other out. Last but not least is the switch for microphone 48volt phantom power for condenser mics. A typical mic input stage. Showing all the controls mentioned above. In all these illustrations we’ve been looking at mono signals for simplicity. All you need to do to create a stereo mix buss is to have 2 busses; L & R and a pan pot to fade the signal between them. A pan pot (that’s a potentiometer to you) is basically 2 rotary faders ganged together, except one works backwards so that as one gets turned down, the other gets turned up. In the middle they feed equal amounts to both L & R.
Thus far we’ve also just been looking at split format mixers – but they have a big disadvantage – size. What if we incorporated input channel 1, group out 1, & monitor 1 all onto the same strip of metal? This is called an ‘in-line’ mixer, and virtually all recording mixers now follow this format. This makes the mixer around half the width and thus cheaper – and easier to work with too, once you have got your head round the fact that all the controls on each channel strip actually aren’t affecting the same signal path! It also allows, for example, auxes and eq’s to be physically switched between the channel strips input and monitor signal paths, thus making the mixer more flexible and reducing the number of actual knobs on the desk. As a mixer is essentially an overgrown set of switches, it is not surprising that in order to give the routing of signals maximum flexibility it incorporates a patch bay. This large array of identical jacks is effectively the sockets on the back of every single item of gear in the studio brought up into one place where experimentation with routing can be achieved without any crawling around the back of things. It also creates a stable grounding environment regardless of how the gear is actually plugged up. Without it, experimentation is awkward and the consequent unstable earthing of the studio is just inviting interference and noise. A patchbay beside a TL Audio VTC at Bath Spa University. Whilst we have been talking about analogue mixers so far, pretty much all of what has been said applies to digital consoles too. Why? Well because so far all digital consoles have been designed to model the internal architecture of the analogue desks that preceded them. This made good sense, as engineers didn’t have to learn a new architecture. Indeed once you have got your head round analogue console architecture, the inner workings of your 02r or whatever seem an awful lot less complicated, and the way that you can program changes to the internal architecture of digital desks reveals their true power. Every desk will have it’s own quirks in the nature of it’s function, so this article is not intended to be a short-form manual for your desk. What it is, however, is an introduction to the underlying signal structure that exists in any mixer design, be it analogue, digital, or even virtual in your PC! Once you can sit there with your eyes closed and visualise every wire and connection, then the gear will never get in the way of your creativity ever again. Line Level – When the meters on a desk read 0 (or as we call it 0Vu – that’s ‘volume units’ by the way) then you can be pretty sure that the voltage on the line will be at one of two standard voltages. Effects – Reverb, Echo, Delay, Harmoniser etc – generally all ‘time delay’ derived effects. These take the signal, mess with it and then you add a little of this into the mix to augment the original ‘dry’ signal. These will be fed from a post fader Auxiliary and returned down a separate channel input or effects return (which is just a crude input with less options than the main ones). Processors – Compressors, Gates, Eq’s etc. These affect the whole signal i.e. the processed signal replaces the original. These are put into the signal chain via an Insert point. 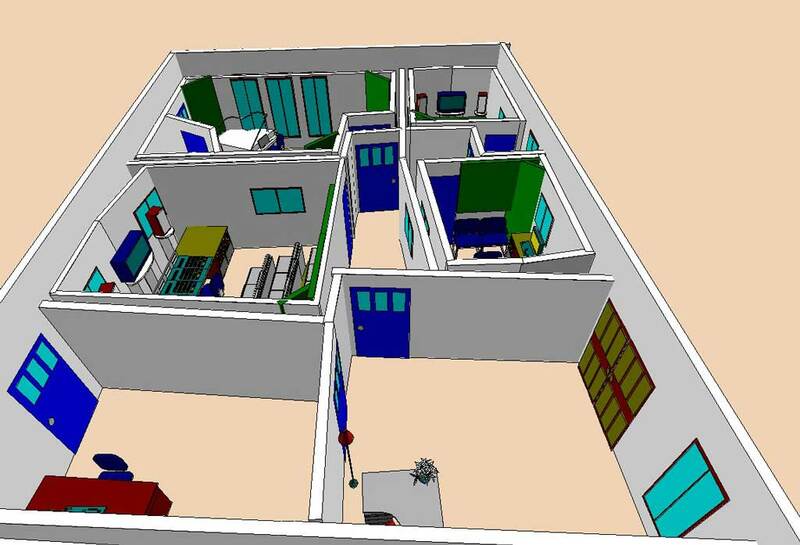 Criteria for the design of isolated studio rooms. A layman’s guide. The studio rooms should be sufficiently acoustically isolated from each other and the surrounding non-studio spaces that use of one space is not compromised by noise emitting from another. 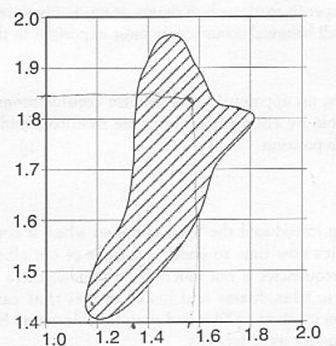 In the building of suitable rooms, isolation is on a sliding scale dependent on the techniques employed, however there is a sizeable jump in the level of isolation available (especially at lower frequencies) when room-in-room construction techniques are used which drastically cut structure-borne noise transmission. As a result the method of creating such isolation structures is not one that lends itself to cost-cutting. Having trapped all sound within each of the recording rooms, such sound (which in normal rooms escapes from windows, doors, ceilings etc. ), rattles around the room, producing a cacophony of reverberation, rendering the room useless for any acoustic purpose. As a result, acoustic trapping must be applied to bring the internal ‘sound’ of the room back to ‘normal’ i.e. 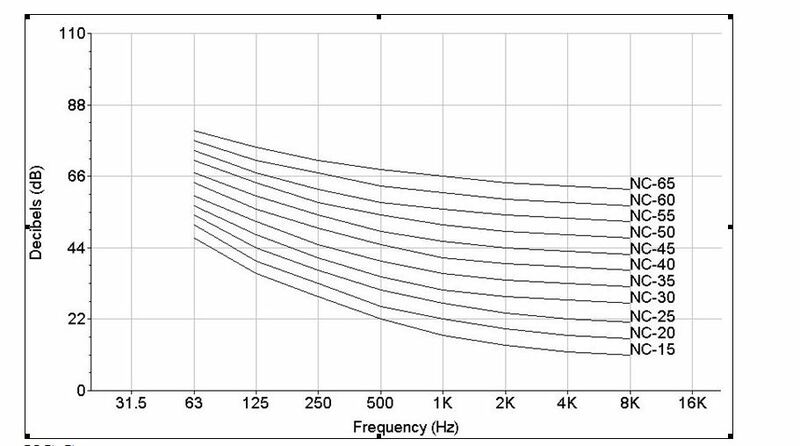 the reverb times across the frequency spectrum must be adjusted to a figure generally considered acceptable for the purpose for which the room is to be used. The internal acoustics of control rooms will further be refined to produce an exceptional stereo imaging from the monitor speakers, allowing the engineer to hear the results of his/her endeavours as free as possible from room artefacts. 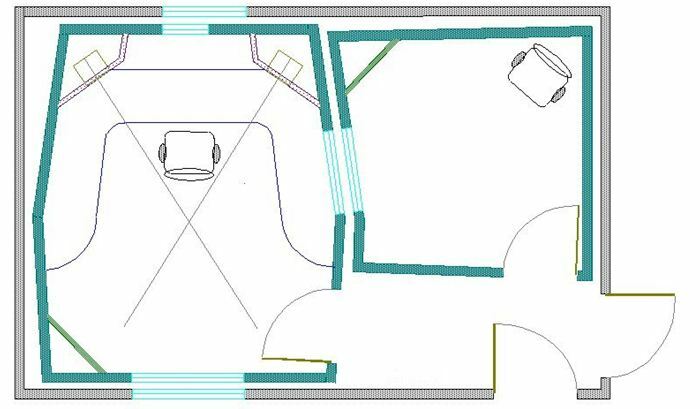 This is taken a stage further in 5.1 ‘surround’ rooms, where surround sound imaging must be stable from all directions, not just the front of the room, and where there has to be an allowance for the presence of (at various times) unused surround speakers acting as unwanted tuned absorbers. Typically, Control rooms will have a ‘flat’ frequency response, with a reverb time consistent across the frequency range that is slightly shorter than the typical domestic environment. 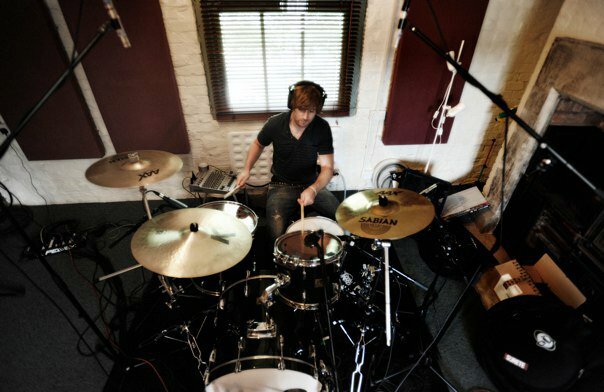 In contrast, recording spaces will vary depending on the purpose for which they are to be used. Indeed the recording engineer uses the ‘sound’ of spaces as part of the palette of sound ‘colours’ with which he/she ‘paints’ a recording. The net result of this is that a good studio usually contains a range of different sounding acoustic spaces from which the engineer can choose. These will range from near anechoic (vocals, acoustic guitar), to heavily reverberant (drums, choirs, and again – acoustic guitar!). The isolation shells will reduce the internal size of the rooms, so special attention has to be paid to the ergonomics of the rooms and the utilisation of space so as to maximise the working area. This is best served by careful design of the space allied with furniture designed to fit the room rather than off-the-shelf free-standing furniture. The listening environment must be essentially quiet so that monitor speaker levels do not have to be turned up high in order to listen ‘over’ the background noise (Such practices result in listener fatigue and shorter critical attention spans when mixing). In a recording room, where microphones are used, the problem is even more critical. As a result, unwanted noise sources within the room (e.g. Computers, a/c etc) must either be removed or neutralised (acoustic cabinets etc.). An isolated room is by it’s very nature totally airtight, fresh air ventilation is a must as the oxygen / CO2 balance in the rooms will otherwise soon change, leading to headaches, reduced attention span and worse…..
Also, isolated rooms are heavily heat-insulated, as the Rockwool used for sound trapping is similar to that used to heat-insulate houses. This – combined with the not insignificant amount of heat generated by the audio equipment means that air-conditioning is an essential. Indeed, even in cold climates such as the UK, most studio a/c systems are cooling (rather than heating) their spaces even in mid winter. 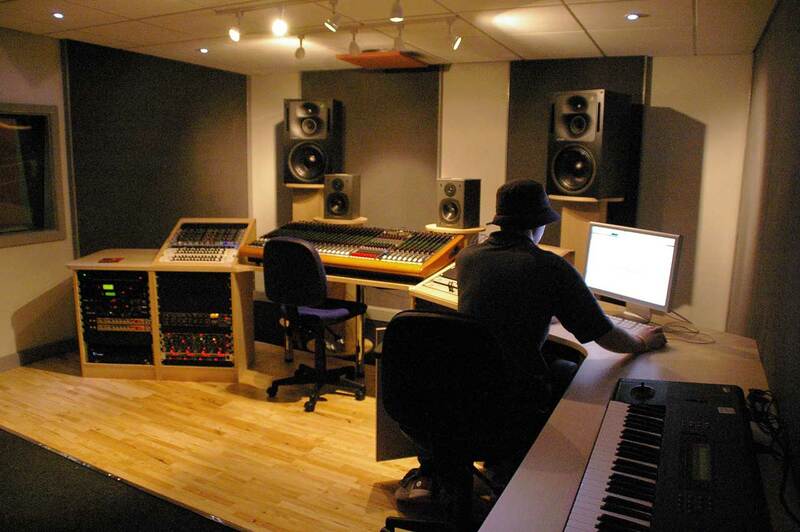 The background noise criteria mentioned above, mean that un-silenced ventilation, normal ducted, or on-the-wall ‘cassette’ a/c systems, are completely unsuitable for studio use. The correct way to ventilate and condition is to use an inherently quiet ducted split a/c unit, which introduces a percentage of fresh air in each cycle. This must then be passed through critically mounted custom silencers (commercial silencers are not up to the job). These silencers stop ingress and egress of external and a/c noise, and also allow more than one room to be fed by the unit without excessively compromising the isolation. 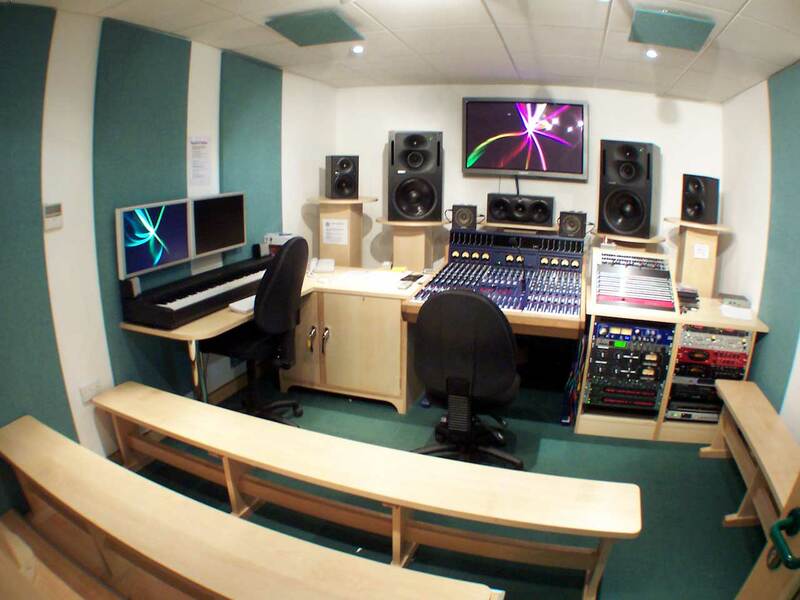 Whilst there are no specific regulations for commercial audio facilities, the new BB93 for acoustics in schools came into force in July 2003, and, whilst (as far as I am aware) this is only applicable if studios have regular use teaching children of school age, the criteria contained therein form a suitable base specification to which all studio projects should aspire as a bare minimum specification for a workable facility. Many of the educational facilities for which we design studios are not, in fact, schools as defined in the Building Regulations. Universities, Colleges of Further Education and some sixth-form colleges do not have to comply with BB93. But by publishing, for the first time, definitive standards for studios in schools, the DfES has set a standard, which even those institutions should consider. Anyone designing a studio for a College or University to a lesser standard than that required for a school should, at the very least, be able to give a good reason for this. Ignorance of the criteria in BB93 will probably not be considered a valid excuse if at a later date it is found that the studios fall within the remit of the regulations.